Rains occur principally in October, November and December, with occasional showers from July to September. The dry season lasts from January to July, and the hottest period from April to August. The most pleasant months are December, January and February. The mean monthly temperature varies from 24.5 ºC (January) to 40.5 ºC (June). The maximum temperature in May-June has been known to touch 43 ºC. The visitor is greeted by mellow colours of cream, yellow, pink and grey with flamboyant bougainvillea bursting over gates and compound walls of cool courtyards. It is a perfect base to explore the rich destinations around it, with day trips to such places as the international township Auroville; the imposing Gingee Fort; the holy temple towns of Kanchipuram, Tiruvannamalai and Chidambaram; and further away, the heritage sculptures and magnificent rock temples of Mamallapuram; and slightly longer trips to the cool and lush hill stations of Tamil Nadu: Yercaud and Kodaikanal. 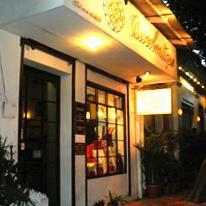 The town is more familiarly known as Pondicherry or Pondy, lingering relics of its French and British past. Colonial-era buildings, a handful of them over three hundred years old, are still to be found, some in remarkably good condition and still occupied. The confluence of history and geography, and of antiquity and modernity, that Puducherry represents has created a rare mixture of values and styles. An estimated 350 temples, some of them little more than shrines, are found in the town and its environs. The oldest among the churches, the Church of the Sacred Heart of Jesus, was built in the 1700s. A major attraction in the town is, of course, the Sri Aurobindo Ashram, and the numerous establishments associated with it—spiritual, cultural, educational, and commercial. Thousands visit and meditate at the twin samadhis of Sri Aurobindo and the Mother around which the Ashram has grown. The inherent ambience of Pondy becomes most evident in the oldest part of the town which flanks the seashore boulevard. Colonial buildings, some of which trace back to the 18th century, line along a grid of straight clean streets and house the French institutions, private homes and businesses, and the premises of the Sri Aurobindo Ashram. Puducherry city is located at a distance of 160 kms south of Chennai, Tamil Nadu, on the Coromandel Coast of the Bay of Bengal. ‘New Settlement’ is how ‘Puducherry’ translates from Tamil. The French turned the name into the more sonorous ‘Pondichéry’, and, when the town passed into British hands, it became anglicised into ‘Pondicherry’ before re-acquiring its original name in 2006. Behind these name changes, the town conceals a colourful history—and another fascinating name: Vedapuri! The ancient sage Agastya was believed to have had his ashram somewhere in this area, though its exact location is no longer known. An inscription in the vicinity of the Vedapuriswara Temple lends support to this belief. This association was responsible for yet another name for the town: Agastiswaram. Actually, its pedigree stretches back much farther in time than a surface view would suggest. A first-century work in Greek, The Periplus of the Erythraean Sea, mentions a maritime trading centre in India named Poduka, which may well have been an early progenitor of this town. Cycling is a favourite way of commuting here, though you now find plenty of motor bikes and cars on the roads. A cycle/two-wheeler/motorbike can be hired from local vendors at reasonable prices against the payment of a deposit. A practice adopted by most visitors! Auto rickshaws and local taxi service are also available. The Sri Aurobindo Ashram is situated in the eastern part of the city, close to the Bay of Bengal. Ashram’s main building, often simply referred to as “the ashram” was the abode of Sri Aurobindo and the Mother during most of their stay in Puducherry. In the inner courtyard is the Samadhi of Sri Aurobindo and the Mother. The Ashram is open to all during fixed hours every day. Sri Aurobindo came to Puducherry on 4 April 1910. 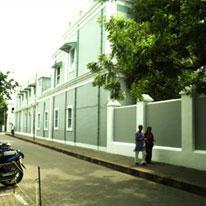 The Mother came to Puducherry for the first time on 29 March 1914. Anniversaries of these two days are solemn occasions for the Ashram community. On 1 January, every year, there is collective meditation at 6 a.m. along with music specially composed for this occasion. On 1 and 2 December, the Centre of Education celebrates its anniversary days with cultural and physical education programmes. Visitors can attend general talks or cultural programmes organised at the Ashram and the Society. They can participate in the collective meditation in the evenings. The Ashram’s and the Society’s libraries and reading rooms are open to the public. Visitors are invited to take up as an offering any work in an Ashram department that may suit their inclination and convenience. Dedicated to the city’s heritage conservation and awareness.